(Middlebury, Indiana) - Located in the center of a predominant Amish community, the Essenhaus attracts many visitors every year. The family-style restaurant and the Country Inn are the two most popular of the eleven buildings located on the premises. Essenhaus attracts visitors from around the country and the globe with its family-friendly atmosphere. Visitors find themselves enjoying rounds of miniature golf, shopping for hand-stitched quilts, and other locally-made crafts. The shopping fun is often finished off with dinner in the famous Amish Country Kitchen. The restaurant is one of the largest family restaurants in Indiana, seating 1,100 guests. No one should ever leave Essenhaus hungry, given that the family-style dinners are all you can eat witch includes a salad, choice of three meats, vegetables, homemade dressing and noodles, The meal also includes fresh bread with apple butter, only to be toped off by a piece of homemade pie. 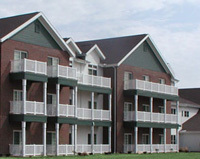 The Essenhaus Inn and Conference Center accommodates Essenhaus’s traveling visitors. Each room is creatively decorated with Amish-made furniture and includes an extraordinary view of the countryside. The Lobby is a gathering center to give a welcome to all that enter the inn. Guests consider the Country Inn their home away from home. Lighting at the Country Inn also receives the KMC touch. Like the remainder of the Essenhaus, the Inn takes on a warm glow even amid the chill of the Christmas season. Programmed controllers supervise the numerous holiday lights that hang, managing the time that the lights will turn on and off daily. Other facility lighting is also controlled in this manner. While the standard environmental and process controls have provided ample evidence of energy savings, Essenhaus has also taken some direct energy management steps. iControl™, the KMC web-based energy metering and monitoring system, has recently been installed in the Inn as well as in the restaurant, and the Noodle House. With several metering-related inputs, the staff plans to monitor peak power usage and, then, make some determinations about off-loading in order to avoid peak-associated charges. Another contrast to the old-fashioned community is the operator workstation running WinControl® XL Plus as the graphical user interface. The famous Noodle House at Essenhaus produces fourteen tons of noodles every week. To ensure that everything goes well with the process, all control system points are monitored using WinControl. All temperatures in the noodle dryers are recorded and tracked to ensure that problems are fixed even before they arise. The same program is used in the restaurant with the freezers and coolers. The appeal of the Essenhaus village has always been its charm and Amish-style hospitality. While its numerous visitors take a step back in time through a low-tech atmosphere, KMC products work behind the scenes, in high-tech fashion, to ensure that everyone is comfortable.